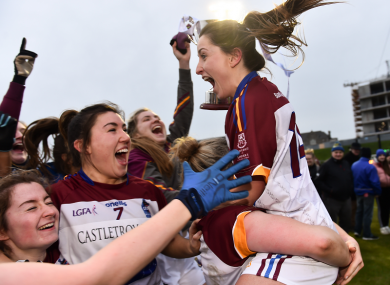 UL's captain Eimear Scally celebrates with her teammates. This was a stunning performance from UL in one of the best games of football so far this year. They defended rigidly, attacked at pace and showed excellent fitness levels to power to the win against the wind in the second-half. Aine McDonagh kept UCD in touch with six points and substitute Chloe Foxe hit the net with a couple of minutes remaining, but there was no beating UL after this display. While the wind was not as strong as in the earlier Lynch and Giles Cup finals, UL were certainly assisted by the conditions in the first-half and they got the bright start they needed when Emma Needham pointed in the second minute. McDonagh landed another sweet point for UCD straight after the restart, but that three-point deficit was as close as they got to UL, who kicked on brilliantly in the second-half. Scally pointed from play, and although Mohan responded, UL scored the next three points as their incredible fitness started to show. McDonagh’s fifth point made it 0-13 to 0-8, but midway through the second-half McHale ran on to Roisin Howard’s pass and flicked the ball over Linda Bruggner into the net. UL scorers: E Scally 0-7 (5f), H O’Donoghue 1-2, F McHale 1-0, R Delee 0-2, S Howley 0-2 (1f), F Tagney 0-1, E Needhan 0-1, O O’Dwyer 0-1. Subs: O O’Dwyer (Tipperary) for Needham (38), F Tagney (Kerry) for Howley (45), S Murphy (Kerry) for Molloy (48), A Healy (Laois) for Cregg (58), E Fitzpatrick (Tipperary) for Delee (58). Subs: C Foxe (Wexford) for McCartan (39), A O’Reilly (Kerry) for Beirne (50), S Fagan (Dublin) for O’Sullivan (53), K Maher (Kerry) for Carr (56). Email “Second-half goals power UL past UCD to a record 12th O'Connor Cup triumph”. Feedback on “Second-half goals power UL past UCD to a record 12th O'Connor Cup triumph”.